Socializing and staying active is an essential part of promoting a positive mental outlook and improving overall health for people of all ages. 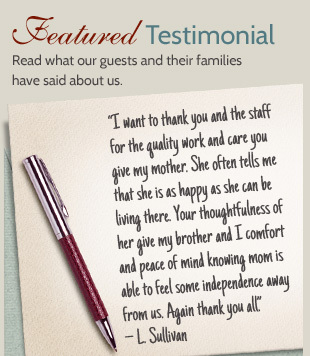 At Caregivers Inn, providing a strong community life has always been a pillar of our home's services. From the friendships that residents create amongst themselves to the genuine relationships with our staff, our residential care home is truly a place for connection. Caregivers Inn also provides numerous amenities that facilitate group involvement. Our ice cream parlor, large front porch, walking paths, sunroom, beauty salon and barber shop are places where our residents can always find company. We also schedule regular activities and entertainment within our home or on our beautiful six acres of property in Missouri. Residents will have the opportunity to learn new skills and hobbies, explore a wide variety of recreational interests and enjoy their time spent staying active. There are also weekly church services of varying denominations offered. Our beautiful location in the heart of a residential community also allows residents to take walks and leisurely strolls in a safe and comforting neighborhood. With many amenities, facilities and parks nearby, Caregivers Inn also schedules regular field trips in O'Fallon, St. Louis and the surrounding communities with our fleet of 25 passenger shuttle buses. This affords our guests the opportunity to get out and about and gain experiences outside of their everyday activities. There is always staff on hand during field trips and activities. We organize a broad range of scheduled activities and field trips, and also provide many choices for hobbies that residents can enjoy on their own time. A cozy environment, good conversation and a wealth of activities, new pastimes and field trips makes Caregivers Inn an expansive, abundant and lively environment. If you would like to learn more about our activities and field trips, contact Caregivers Inn today!